Kenmore 2120 White Top-Load Washing Machine, 3.5 Cu. Ft. The Kenmore 2120 top-loading washing machine is a highly efficient washer that comes in a compact frame. It's a no-compromise machine that cleans your clothes effectively, while constantly maintaining low electricity consumption. Small families or individuals looking for a compact washing machine will be well served by this appliance. It should serve your modest needs very well at a cost that is reasonable, given its features, settings, functionality, as well as stylish design. The 3.5 cubic feet interior capacity should be enough for your needs. This is equivalent to roughly 28 XL shirts in one operating cycle. This model comes with a white porcelain wash basket that is extremely durable, will resist scratches, and won't absorb colors. The 700 max speed speed allows the machine to clean more effectively, as well as extract more water from your clothes during it's drain cycle. The Triple Action agitator included in this model moves in many directions, effectively cleaning your clothes without damaging your precious fabrics. An included bleach dispenser will allow you to carefully control the amount of bleach you include in the water to match the fabric types in your laundry. The white powder-coated exterior finish simply looks elegant. It is scratch-proof and will ensure years of rust-free operation. The model includes easy-to-use exterior controls that will allow you to fine tune its operation based on your needs. The exterior lid will lock automatically before the start of a cleaning cycle for utmost safety for everyone in your household. Its exterior controls are fully automated. Just set it to your desired operating preference, then you can let it do all the work. This model comes with a remarkably compact exterior frame and an elegantly engineered white powder-coated finish. The washer is highly energy-efficient. The porcelain cleaning tub inside the unit won't absorb any odor from the water or detergent you use in your home. It's also very durable. The fully electronic controls of this washer are extremely easy to use. The motor of this washer can run up to 700 rpm to clean your clothes quickly and effectively. Safety comes first in this machine with its automatic lid lock. As with other compact washers, this model can only clean a modest load of clothes and other fabrics per operating cycle. The fully electronic controls of this machine can be a pain to repair and maintain. This unit is slightly more expensive than other manually operated brands with the same capacity. 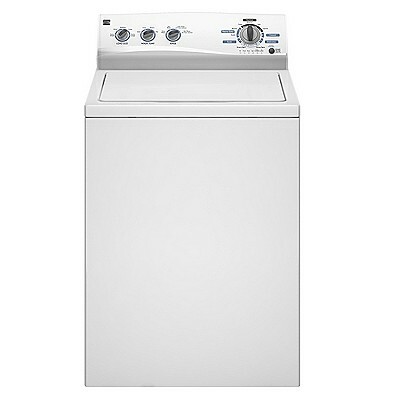 Comments for Kenmore 2120 White Top-Load Washing Machine, 3.5 Cu. Ft. I owned this washer for about 18 months and it has been continual problems with the lid lock. The locking mechanism finally failed completely. I spent $55 and replaced it and it still didn't work. Yesterday I replaced it with a GE with no lid lock mechanism. I will never own another locking washer. The more simple the better. machine will not rinse on normal cycle if one rinse is selected. if rinse cycle is selected it does fine. have had three service calls so far and it still is not fixed. they are working hard this time to fix it, got their tech dept. on the line but they seem lost also. wish i had gotten a 400 series as it was tried and true. OWNED THIS WASHER FOR 4 WEEKS AND THE LID LOCK IS SHOT ALREADY.... THE WASHER WON'T WORK AT ALL WHEN THE LID LOCK DOES NT ENGAGE!!!! I USED TO OWN A CYLIPSO WHIRLPOOL SO I'M SOOOOO TIRED OF MY WASHER BRAKING DOWN I COULD SCREAM!!!!! !